Where do you get melatonin? 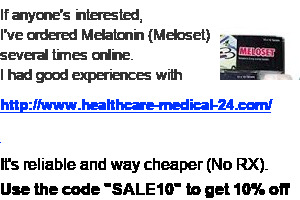 I am using 2mg Melatonin with great results. But the pharmacy asks R400 for 30. Madness. But I'll pay if there is nothing else. I can import from iHerb at R300 for 3 months worth including transport, tax etc. But customs may want a prescription from a doctor. Where do you get yours from? Currently I just grab it from the pharmacy. I only use 500ug a day, that way it lasts me a long time. More than about 750ug makes me groggy in the morning anyway and may also down regulate endogenous Melatonin production. My bed provides me with all I need. I also use melatonin for when I travel. You used to need a prescription.... asked my pharmacist the other day and he said the requirement for a script has fallen away, but the suppliers still need one from the pharmacy.....guess the suppliers need to get up to date..
Txs. I think I can go down to 1mg. Vitacost look great. I'll have to order and see what they charge for shipping. iHerb.com delivery is about 35%. And then you pay taxes plus R150 handling charges. Read the thread I quoted above. You don't need a prescription for Travel purposes or Jet Lag. But when using it as a sleeping pill you do need a prescription. So when asking the pharmacist, just tell them you require it for Jet Lag. It's not a story, it happened to me personally. You can Google the S4 status of Melatonin for yourself. Pharmacist give me the same story. For jet lag, travelling you can get melatonin without a prescription. Txs. Txs. Took some time to understand what you were saying. Missed it. Tried that with 2 pharmas. Neither bought it. Eventually just got a GP to write me a half a year script. Needing a script for Melatonin but not for codeine based pain killers like Adcodol or Syndol is a joke. Apparently it has to do with the neurological effects of the drug. Something about it's effect on neurotransmitters or something like that. There was some discussion on it in the other threads on the drug. Why not try to fix the cause instead of the symptoms? Why are doctors and their patients obsessed with fixing the symptoms temporarily? Its a great business model for big pharma. Sometimes there's no fix for the cause so symptomatic relief is about the best way to go. Until there's a fix, I'd rather that people sleep well using melatonin than prescription sleeping pills that can have long term side effects. edit: Now tell me where to get Yelate and Tramahexal and we have a party. Melatonin is wonderful. The only side effects are vivid dreams which is somewhat connected to sleep!